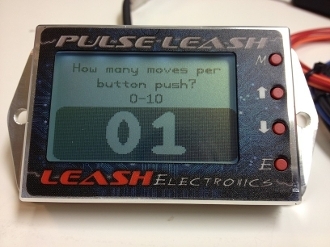 Pulse Leash push button staging system. Staging system designed to help with consistant staging of high powered turbocharged race cars. No more need for extra braking to prespool a car anymore. No need to apply extreme, uncompfortable pressure on you brake peddle. Allows you to be much more compfortable in you racecar and focus more on cutting good lights. With this controller you can prestage your car then press your transbrake button and start prespooling. When you are ready to go in full stage you simply press and release a secondary button 2-3 times which pulse the ground on your transbrake solenoid and allow you car to ease into the beam. Note this applys no extra wear on your transmission!! Unit can be set to be as sensitive as you want. There is also a feature that no other unit has. There's an auto pulse setting. Purpose of this is that if you have your sensitity set really soft and it takes more pulses to move the car into the beams you can set the autopulse to pulse more times with each button push. So if it takes 3 button pushes to move your car into the beam due to having your sensitivity set soft you can set the auto pulse to pulse 3 times for the first button press. And after the first button push it then will pulse once per button push. So you only have to press your pulse button 1-2 times. This is a fine tuning feature. You can also hold the button down and is will rapid pulse. So this gives you 3 different control strategies.